The Skinny: Ringo Lam cashes a check and works with Jean-Claude Van Damme again in this harrowing, but ultimately typical prison drama. The annoyingly self-important script overshadows the fact that this is one of Van Damme's best performances, which is probably a statement that precludes the Apocalypse. Better than average B-movie stuff, though not much more than that. Count 'em. This film marks the sixth time Jean-Claude Van Damme has corralled a big name Hong Kong director into working with him. In Hell also marks the third time director Ringo Lam has been paired with the Muscles from Brussels, but things seem a bit upside down. Instead of a made-to-order Van Damme crap-a-thon helmed by a Hong Kong director, this is a Ringo Lam-type film which just so happens to star Van Damme. Mr. Universal Soldier keeps his kicks and pretty boy preening out of the picture, and instead plays a broken, battered shell of a man who seeks redemption at the end of his rope. No, you did not read that wrong: Van Damme has been asked to play a character, and not some muscled bohunk who does splits to the delight of his drooling female fanbase. Predicters of the Apocalypse: ready your scorecards. 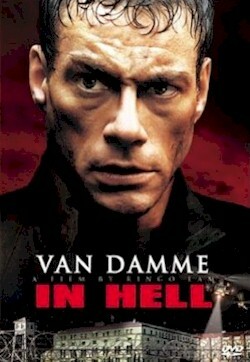 Van Damme is Kyle LeBlanc, an American working in an Eastern European steel mill. Sadly, Kyle gets sent up the river when he kills the man who murdered his wiferight outside the courtroom that just acquitted him. He's sentenced to life inside the big house, and what a house it is. Corrupt from tower to septic tank, the prison is every male heterosexual's nightmare joint, where the prison guards delight in catering to the prison gangs who line their pockets with a little extra. Aside from giving extra perks to the mafia who pay them, the guards also provide "fresh meat" for those who are willing to pay for it. To wit, if you're good-looking like young Billy (Chris Moir), expect a friendly new cellmate for ninety minutes. Kyle is spared that indigity, and instead is stuck in a cell with Prisoner 451 (Lawrence Taylor), who apparently has severed the tongues of a few of his cellmates. He's also thrown into "the hole" a lot, which gives him time to reflect while admiring the waterfall of sewage which periodcally falls into his room. Eventually, Kyle is called upon to participate in the prison's main attraction: a brutal fist fight to the death, which is gambled upon by various military personnel and the prisoners themselves. It's really a sick sort of place: friend turns against friend, honor is nonexistent, and those who rule are the worst ones around. Stuck in this living hell, Kyle succumbs to the darkness and begins to lose himself to the primal brutality of his surroundings. Can he bring himself back? And will audiences buy that Jean-Claude Van Damme is actually trying to act? If Internet message boards are to be believed, then the answer is yes. Apparently, more than a couple of Van Damme watchers give props to his performance in In Hell, and to be honest they aren't totally off. Van Damme does attempt some form of inner emotion that fits the role well, though the degree of his success isn't really that high. His performance is reasonably solid, but he doesn't bring more to the table than any number of B-type actors could have. More credit should be given to the fact that he keeps his usual shtick to a minimum. No splits occur, nor any high-flying roundhouse kicks or punch-em-in-the-face preening. He's supposed to be a broken man who finds his way back, and if that's the case then nice job, Jean-Claude! Maybe five guys in a basement will give you an acting award.